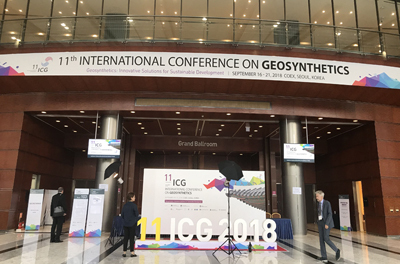 Under the auspices of International Geosynthetics Society and hosted by Korean Chapter of IGS, the 11th International Conference on Geosynthetics was held in Seoul, Korea on Sep 17-20, 2018. TMP General Manager Mr. Peng Wang lead the team for this exhibition. 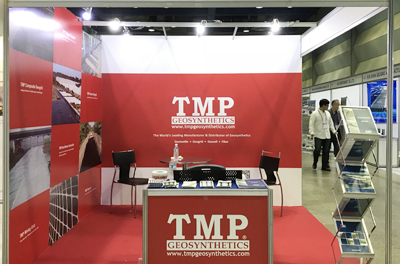 TMP showcased all of its geosynthetic products including PP biaxial geogrid, HDPE uniaxial geogrid, composite geogrid, mining geogrid, geocell, continuous filament needle punched nonwoven geotextile and engineering fiber. New and old customers from all over the world has friendly talks with us at the exhibition and they highly appraised and affirmed TMP’s products and services and had exchanges on the industry situation and market trends deeply. By attending 11th ICG, TMP gained numerous face to face communication with customers, and attained more information about the industry situation and market trends, which helps to accelerate TMP’s globalization in a bid to expand the global geosynthetics market share.